I know it's a little late, but half the reason for my pause was because of the topics covered during this week which may need a little tact in explaining, plus an adult guidance certificate? The first event on my arrival, was to serve up my shin as a five course meal for the midges. - In a very fetching diagonal stripe. Argghhh. Wet humid woodland weather this week. On the course we had some budding chair makers and a few sculptural bench makers. We only had four campers in the wood, two down the lane in a camper van and the others leaving us to it for the evenings. 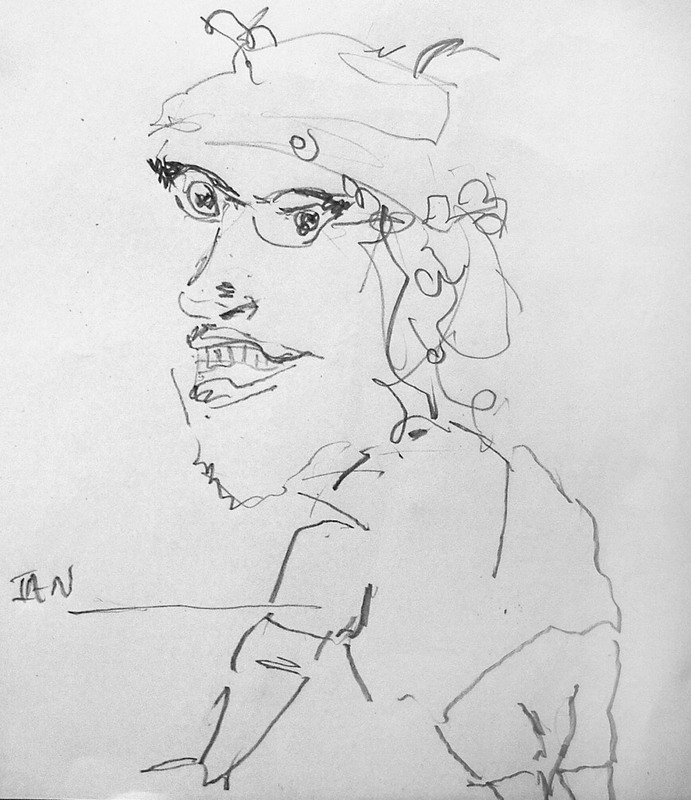 It didn't even take one evening before Ian (on a return trip to Clissett) drew out (on paper that is) his new spankula design. The Flipmate 6000... for discipline on the go! Designed like a flick-knife for rapid action. Also mentioned was the mini version, the 'Pursemate 600' (patent pending). 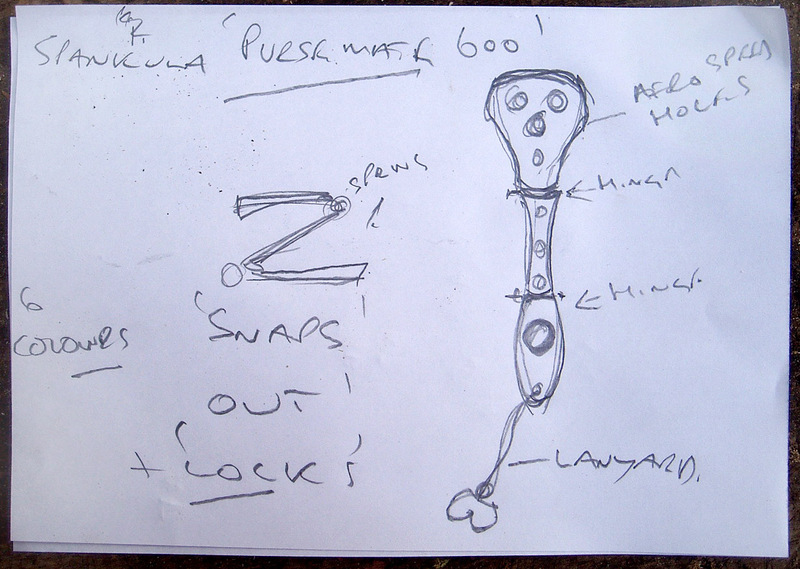 Note the 'snaps out and locks' design and the worryingly bottom shaped trinket on a lanyard to hang out of your bodgers pocket, (it's a sign to those in the know). And no, I don't have one of those in case you were wondering! So, with my free afternoons I turned to my bowl lathe for a good practice since only making one bowl previously on the Ben Orford course. Martin had given me some freshly cut eucalyptus which I had roughed into a few bowl blanks two days previously. Unfortunately (or not) during the seering heat the blanks had started to crack in the way eucalyptus does - all over the place! I must be more careful storing the logs.. But still I wanted to see how they would work out and made one bowl each afternoon. Getting progressively quicker and more aggressive until my elbow really ached. 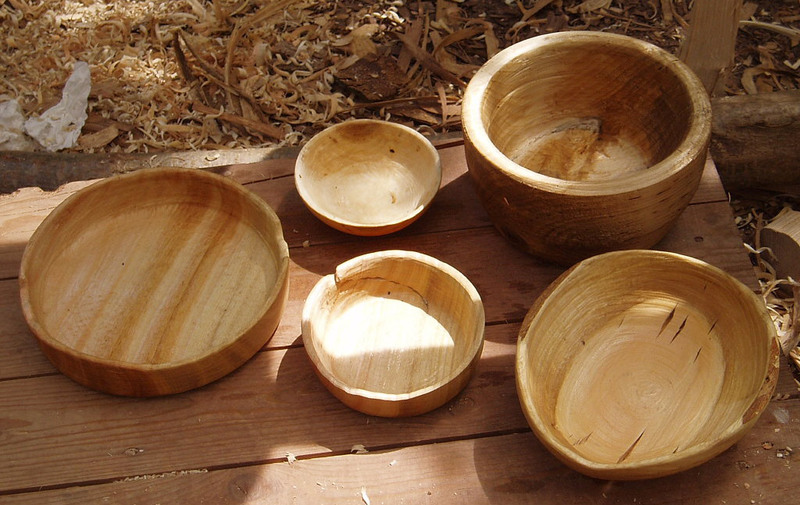 You can see on the left, my bowls 2, 3 and 4 in eucalyptus, next to a Robin Wood spalted beech bowl which John the fireman had brought out to show me. No. 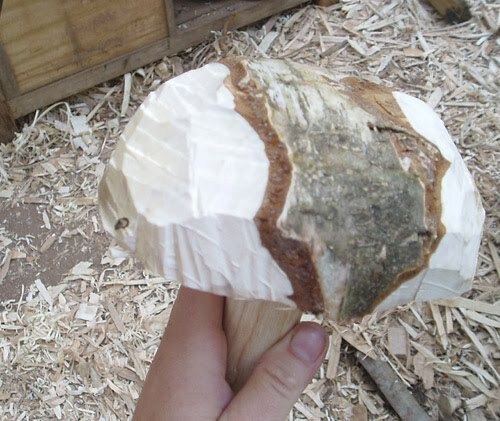 5 was a sweet little silver birch mushroom just prepared for turning. I keep joking that I only want to make teacups and saucers, but this was a really lovely shape to work. 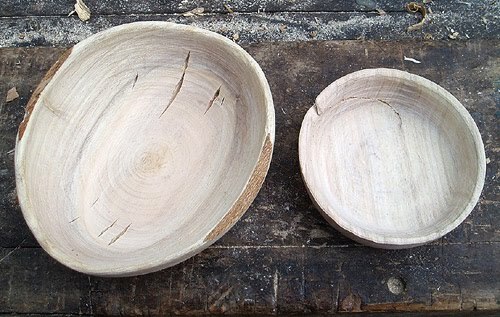 Bowl turning the silver birch was a bit of a furry event on the end grain and took some cleaning up with the knife afterwards, but I just loved the size and the lightness of it. On this day I finished early and headed off to British Camp on the Malverns in search of a cool breeze and a good view to paint. Lastly this week was a monster deep bowl of poplar. 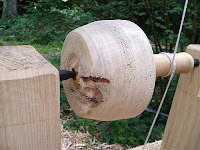 A rather large knot appeared to be coming out of the bottom, not great for the tools I know, but I wanted to see if I could try a bowl with almost straight sides and about 3" deep. The poplar was the only piece of wood to hand deep enough to try this. Despite it being hard work because it wasn't even green, it's come up with very interesting and lovely colours - greys, golds, reds and makes a convincing small fruit bowl. 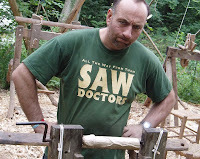 Thanks to John Rees for making me a little hook knife at the wood to finish off the bowls. Very useful! After showing a 'certain person' my efforts and them being called 'ugly', I am now launching my new range of Natures Ugly Bowls. These are quite simply the best thing in which to put your ugly fruit and veg. I rest my case. Other comments on the bowls go generally along the lines of 'it makes a good lampshade...or hat. 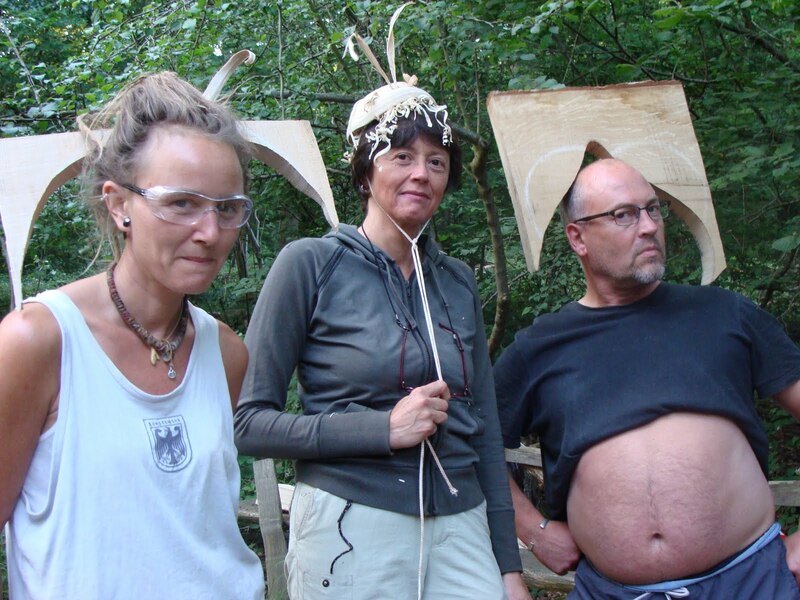 Now the bodgers camping here had a little fashion show one evening, sporting my bowls on their heads with shavings as hair and other plank offcuts as head-garb in a modern catwalk look. So onto other matters... 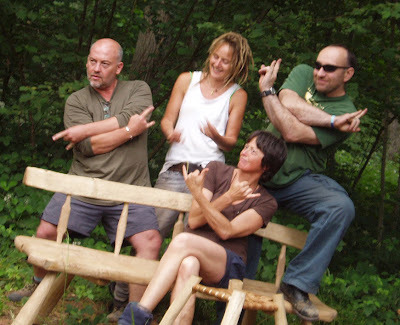 In da wood, der was de Clissett Crew, in-it. 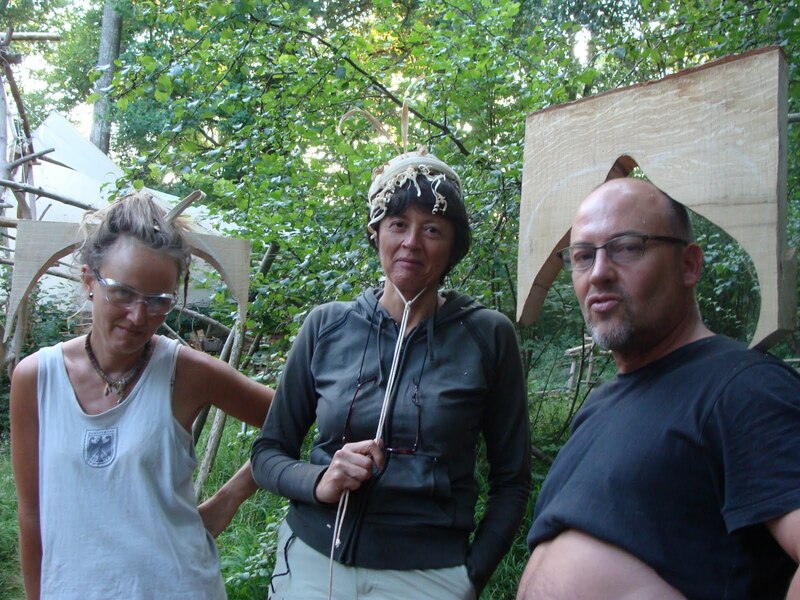 An deeze were de campers gettin' up to de funny biz nez at nite. Wicked. I tink I wanna ravish-'er. Imagine on and on..luckily only travishing went on, apart from Ian's impersonations to keep us rolling around with laughter. My only regret is not being part of this photo. 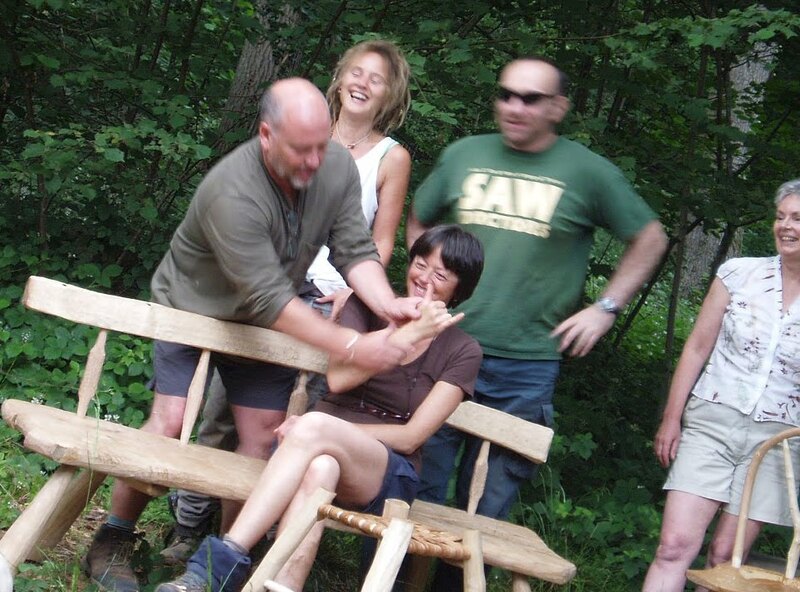 Here is a picture of Ian with his wonderful running legged ash bench. He made some metal staples to go across the split, and carved 'A Good Run of Ash' in the underside. Gudrun..get it? You could tell he was an actor when he returned from a beer-run on the last evening with bicardi breezers and stella served in a bucket of ice. Nice touch! As well as making a substantial oak bench, and an excellent bolognaise, fireman John, who is used to making trinkets and masses of other craft things tried his hand at wood turning.. and oh dear what do you know, he made his wife a fertility dibber. Whilst Dave made his wife Pauline a wife-beater. All I can say is it must have been the hot weather! 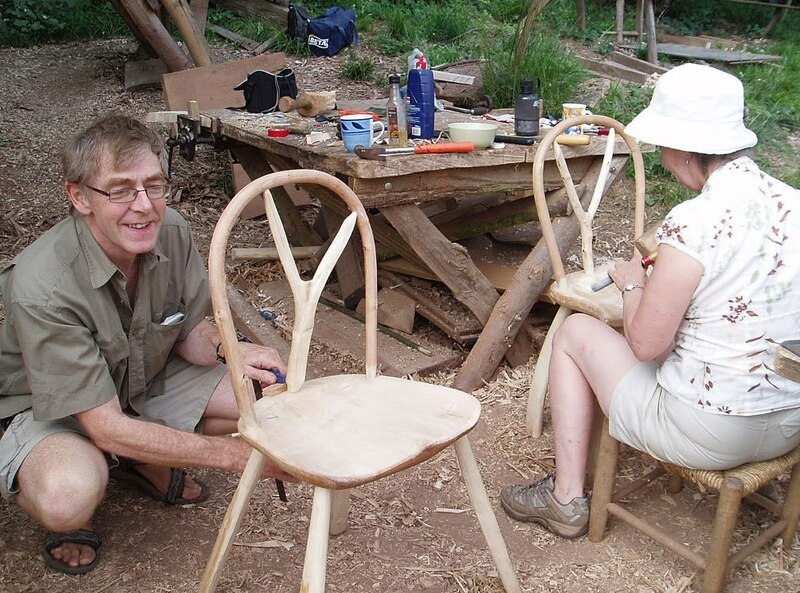 This is Dave and Pauline who made two nice chairs between them. 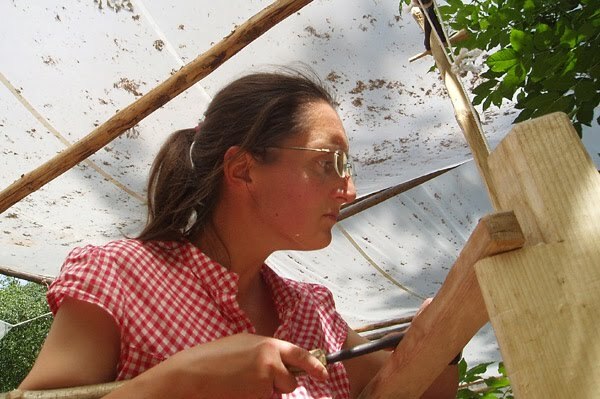 Anneka made a little stool with wych elm bark seat as well as an unfortunate trip to A&E after poking herself in the eye pulling out a tenon. Ouch! This week we also had a happy couple celebrating their 25th Wedding Anniversary, for which Jo (the cook) dressed the table in a traditional Portuguese style with ferns and woodland flowers. Hanging above them she made a willow heart decorated with flowers too. Cake and gooseberry fool was eaten! 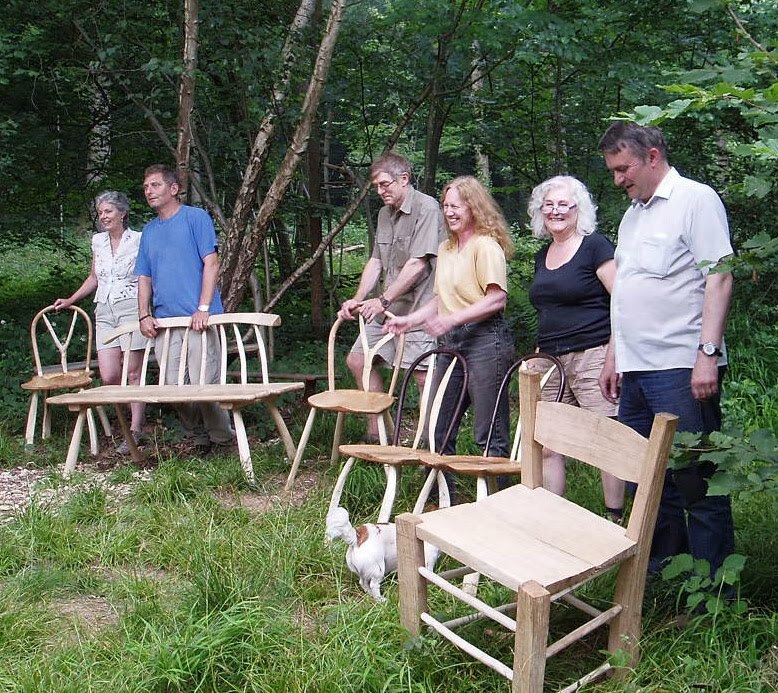 So lastly, a few snaps of the finished chairs and benches. Colin with his very substantial ladder back and slatted seat chair. 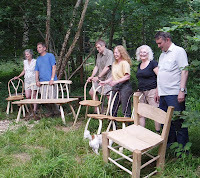 Also Deborah one of the Clissett Wood owners made a hooped back windsor style chair. 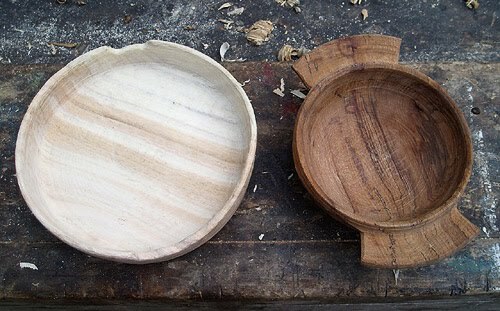 Lastly here is a picture of my final bowls from the week, oiled up and fully warped. The eucalyptus is getting quite an orange glow about it now. Thank you to such a great group on this course. My ribs were aching from laughing too much! Fashion hat show, thanks to Anneke for the photos! Yesterday I enjoyed a busy day in the Black Country demonstrating the pole lathe and 'have a go' sessions at the Springwatch Wild Day Out in Sandwell Valley. The purpose of the day was to promote biodiversity through a range of 'hands-on' nature based activities to people of all ages. It was very busy all day on my stand with 2 lathes going and 2 shave horses on hand. Quite a few kids came back for a second go after walking around the site. 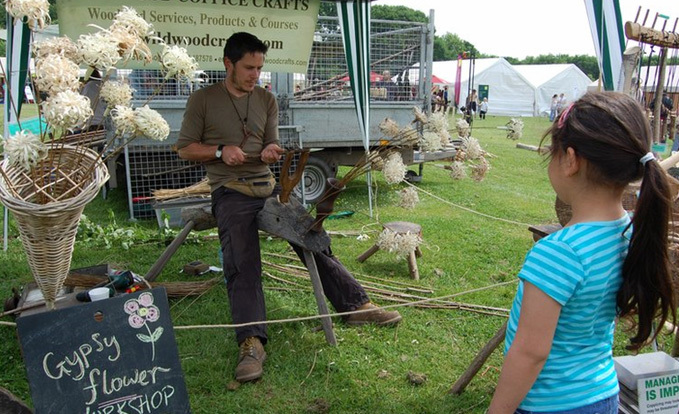 England, we had Larry Jones making hazel hurdles, Tamzin making willow weaving, Jo Callaghan doing art with the kids inspired by nature, Granville Reeves making besoms, Dave Jackson making Gypsy Flowers, Peter Harmer chainsaw carving, Doug Joiner with heavy horses, Sherwood Keogh making cleft Oak fencing, gates and hurdles. 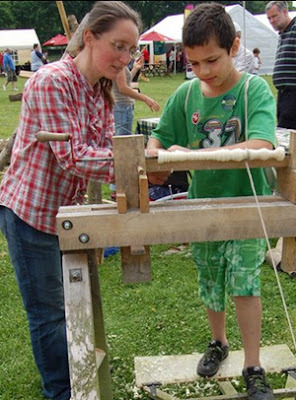 Jacqui Parkes with her milking and cheesemaking demo, Toby Allen and Aly May with their vintage pailing machine, then me on the pole lathes. Around the outside of the site were marquees with local nature groups and activities to encourage and inspire the public to get involved. Quite a while ago I painted a picture in the woods, it was a kind of impressionistic woodland scene with long time volunteer at Clissett Wood, Kean in the distance working away. He liked it so much he asked if he could have it. 'Sure', I said and gave it to him. 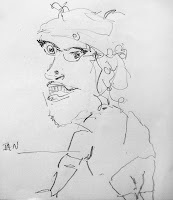 Kean though, was not willing to accept the painting for free, so I suggested doing a greenwood trade. 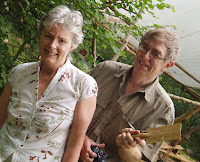 "Think of something I could do for you Liz", he said, and I suggested he make me a nice cooks spatula because I've used many of his lovely spatulas in the Clissett Wood kitchen. - or two things in fact. A cooks spatula and spoon! 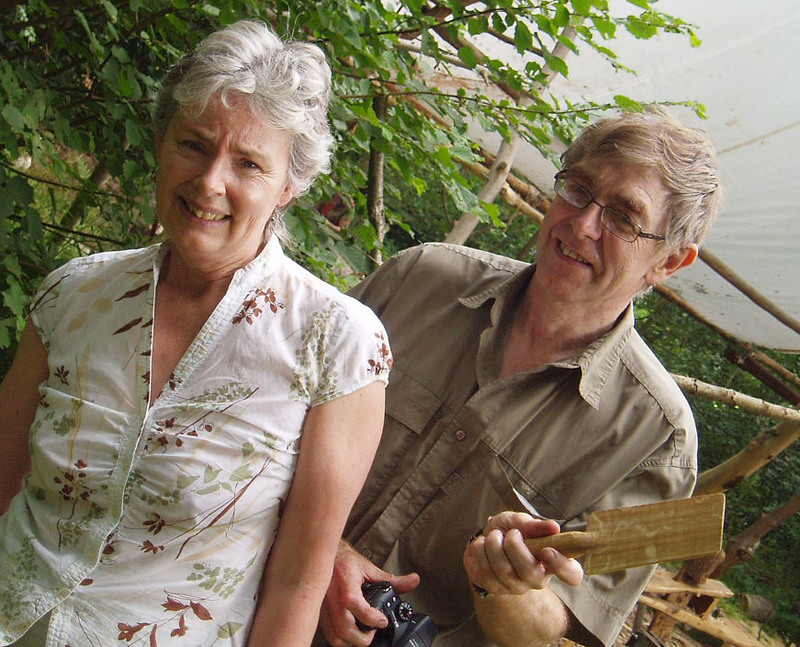 Made from the two halves of a cherry log from a tree cut down in Herefordshire this May 2010. I have to say that I was really gobsmacked at how lovely they are. Thankyou so much Kean they are really beautiful! !